World's first combination news/food truck kicks off cross-country tour at SXSW. Kicking off on the day the film arrives on Digital, the AnchorVan will make stops in Chicago, Indianapolis, Cleveland, Pittsburgh, Philadelphia, Washington D.C., Boston and finally New York City on April 1st, when the film debuts on Blu-ray(TM) and DVD. WHAT: If you've been wondering where you can go on-camera to test your teleprompter reading skills like legendary newsman Ron Burgundy and score some of Champ Kind's Whammy! Chicken ("of the cave"), you're in luck! The one-of-a-kind AnchorVan begins its national trek to bring anchor-action, juicy chicken ("of the cave") and news of the home entertainment arrival of the smash hit comedy Anchorman 2: The Legend Continues to people across America. Don't miss the grand unveiling at SXSW with Ron Burgundy's best friend and enthusiastic carnivore, Baxter, the film's beloved four-legged star! Kicking off on the day the film arrives on Digital, the AnchorVan will make stops in Chicago, Indianapolis, Cleveland, Pittsburgh, Philadelphia, Washington D.C., Boston and finally New York City on April 1st, when the film debuts on Blu-ray(TM) and DVD. 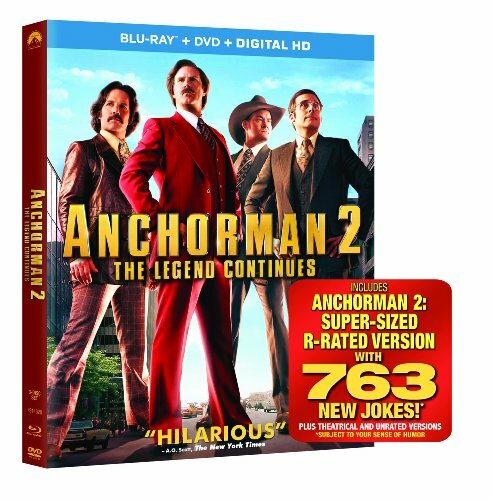 Anchorman 2: The Legend Continues Blu-ray Combo Pack includes three versions of the film--the original Theatrical Version, the Unrated Version and the Super-Sized R-Rated Version with 763 new jokes--along with over four hours of bonus features.